Document Management | Donnegan Systems Inc. The need to retain files in many forms and to manage them effectively is essential to an organization’s viability. At Donnegan Systems, Inc. we make this happen! We offer every level of service and all the right products to modernize and enhance the efficiency of our client’s record management system. We understand the document management needs of a variety of clients including doctors, hospitals, insurance companies and insurance agencies, banks, credit unions, investment firms, government agencies, manufacturing and industry. 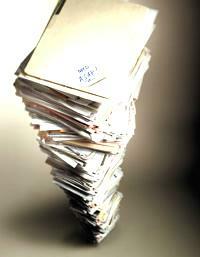 We particularly understand the document management requirements of those firms that have adopted ISO 9000 standards. We can tailor a document management solution to fit the needs of any organization…HIPAA Compliant Solutions are a specialty of ours. Microfilmed images, letter and legal sized documents, forms, engineering drawings, specialty sized papers, and scanned images residing in computer hard drives or optical disks: these are the documents of the new millennium, the repository of organizational memory. Software designed to track files, whether scanned images, rolls of microfilm or paper files. 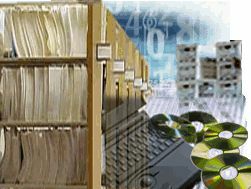 These are the information management tools available to the record management professional. Systems that can modify the form of a document-from paper to scanned image or filmed image—and back again are the tools of modern day record management efficiency. And utilizing the least costly storage methods for documents as they age is the best answer to document management budget concerns.